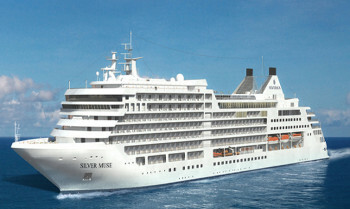 Silver Muse is ready to explore all the fantastic ports and cities that border the Pacific Ocean. In Alaska, Silver Muse primarily operates 7 night cruises from Vancouver to Seward or (vice versa) visiting Ketchikan, Skagway and Sitka just to name a few. Heading to warmer climes, Silver Muse has explorations in both Asia and Australia. Cruise from Hong Kong, Singapore or Tokyo to the exotic far east with cruises ranging from 10 to 16 nights. When in Australia you could discover the tropical islands of the South Pacific or the culture and nature of New Zealand with cruises from Sydney or Auckland. View all Silver Muse cruises or view more options for Silversea cruises. Atlantide: Instantly recalling images of the sea in all her watery majesty, the Atlantides are the seven nymph daughters of Atlas. Creative muses, known for their wisdom and beauty, the sisters were granted immortality in the form of stars and can be seen today in the constellation of Taurus.Pivotal to the Silver Muse dining experience, this elegant bar and grill incorporates the best that the sea has to offer. Created to temper your taste buds, designer dishes such as royal crab, blue lobster and Verbena infused red snapper in a sea salt crust are showcased alongside the best steaks offshore. La Terrazza: An iconic hallmark of Silversea dining, La Terrazza offers authentic recipes and the freshest ingredients from our distinctive Italian heritage. This is where antipasti, primi and secondi come together with passion and flair in a flavourful expression from corporate chef Alberto Colombo’s imagination.La Terrazza aboard Silver Muse offers innovative interactive food stations: an olive oil cellar, a mozzarella bar, a seafood station and of course a salumeria. The à la carte menu has also been extended to include the popular Sapori di Casa, traditional family-style Italian daily specials. La Dame by Relais & Châteaux®: La Dame by Relais & Châteaux® features a bespoke menu by top chefs from the Relais & Château team, and is the highest expression of excellence of French dining that Silver Muse has to offer. The ambience is one of chic contemporary style, with crisp white table linens and the impeccable white gloved service associated with Silversea. The boutique hotel and gourmet restaurant guild Relais & Châteaux are unsurpassed in their belief in standards of hospitality, personalized service and outstanding cuisine. Rooted in these shared values, Silversea is proud of its privileged collaboration and its continued partnership for the pursuit of excellence. Kaiseki: The fine art of Kaiseki lies in its meticulous preparation and beautiful presentation. Dishes reflect a passion for tradition and performance and our reinterpretation of these values is clear. Balanced menus have been inspired by the five elements of Japanese nutritional cuisine and respect the equilibrium of yin and yang. With teppanyaki available exclusively for evening diners, daytime menus feature a varied and balanced menu of sushi, sashimi and other raw Asian-inspired dishes. Indochine: Evoking a sense of exotic mystery, the Asian-accented Indochine embarks you on an exquisite journey of culinary discovery. Unlock the hidden treasures of the spice markets of Mumbai, whet your appetite with the exoticism of Thailand and temper your taste buds with the cuisine of Vietnam. Elegant and exquisite dishes bursting with Asian essence awaken your gastronomic senses and immerse you in an expansive tapestry of the palate. Silver Note: Small plate tapas-style dishes of mouth-watering international cuisine perfectly compliment the rich, exciting entertainment as the smooth sounds of jazz and blues gently caress your ears. A refined late evening menu perfectly showcases the panache and style of Silver Muse’s plentiful dining options, so expect multisensory fireworks as you swing and sway effortlessly across the dance floor as Silver Muse gracefully takes you to your next destination. Spaccanapoli: Reflecting Silversea’s Italian heritage, this emblematic street in Naples divides the city in two and is renowned for its pizzerias. No visit to the city is complete without a journey to Spaccanapoli. Therefore it is unsurprising that Spaccanapoli aboard Silver Muse reflects the true Italian way of life: the freshest ingredients, authentic dough and a perfect sense of the fabled Italian lust for life. The simplicity of la dolce vita is reflected in the relaxed dining style of the restaurant. Nestled cosily on deck 8 is the all-new Arts Café©. Hosting varied, exciting and constantly changing exhibitions, the Arts Café© will showcase paintings and sculptures from a broad range of talent. The distinctive design of the venue is a relaxing getaway and offers daytime cuisine in the form of a café and deli-bar. But come early evening, the venue turns into a lively, evening cocktail lounge. Channel your inner James Bond and enjoy a flutter at a variety of table games including American Roulette, Blackjack and Ocean Poker as Silver Muse glides silently through the waves. An assortment of multi-game, multi-denominational reel and video slot machines are also available. Prepare yourself for a luxurious and exhilarating experience with every turn of a card and spin of the wheel. Game on! Rich and luxurious, yet airy and spacious, this indoor/outdoor venue is where you sip the finest cognac or whisky from a prestigious range and revel in the tranquil murmur of after-dinner conversation. A premium choice of cigars is also available, making this a perfect evening haven of serenity. Central to the soul and inspiration behind Silverseas Italian heritage, Dolce Vita is the gathering place for our savvy travellers of the world, a place where guests mingle and exchange stories and where new faces become lifelong friends. Let us spoil you with an incredible array of flawless cocktails, wines and spirits, as you relax, enjoy the evening sounds of a live pianist and enjoy the sweet life aboard. The epitome of open air living  defining how you enjoy the outdoors, this is the place to cool off, unwind and enjoy the sunshine. Take a dip in the pool, relax in one of the whirlpools or simply soak up the view from one of the sunbeds, while your pool attendant anticipates your every whim. Sweeping sea views from the floor-to-ceiling windows, nine treatment rooms, an acupuncture suite, relaxation areas and a dedicated outdoor whirlpool allow delectable indulgence on board. Invigorating therapies including facials, body wraps and massages, plus mens and womens saunas and steam rooms are perfect for relaxing before your spa treatment or after your workout. Set on the highest level at the very top of the ship, this is a quiet space for reading and reflection while being dazzled by the undulating seascapes that are constituent to life on board. Borrow a book from the in-house library, read the papers or just embrace the tranquility of being at sea. Paying tribute to a golden age of glamour, Venetian Lounge offers belle-époque style cabaret seating, with intimate tables and chairs subtly placed between the rows of comfortable tiered banquettes. As the stage lights are dimmed, soak up the atmosphere, relax and enjoy a night of dazzling sights and sounds. Innovative menus crafted by world-renowned chefs. Private tastings in the most distinguished wine regions of the planet. An interactive, onboard gastronomic experience presented by Relais & Chateaux. Silverseas food and wine cruises deliver the worlds most delectable flavours directly to you. Fully indulge in the cuisine of your voyages destinations. Entice your appetite while observing chef demonstrations and savouring a grand gourmet dinner aboard our Culinary Arts Voyages. Relish onboard vintner lectures, intimate tastings, and pairings of red and white varietals with both lunch and dinner on a Wine Series Voyage. And for those craving to refine their culinary talents, the L’ Ecole des Chefs cooking school serves up a broad curriculum of tantalising events, designed exclusively for Silversea cruises by Relais & Chateaux. A competitive yet playful ambience. A formal programme featuring daily Contract and Duplicate Bridge sessions (twice daily on sea days). Informative Bridge lectures for both beginning and intermediate-level players. Aboard a Silversea Bridge Sailing, we ensure your comfort and entertainment is the name of the game aboard our ultra-luxury ships. Play alongside like-minded, fellow guests on board our ultra-luxury ships. Certified ACBL (American Contract Bridge League) Life Masters oversee games, with the chance to earn ACBL Master Points. Silversea provides complimentary Bridge materials and play in an exclusive onboard Card Room. All you need to bring is an aspiration for victory. Imagine exploring the history and culture of captivating destinations before you ever step foot off your ship. The dignified monuments. That secluded locals-only shoreline. A centuries-old craftsmans workshop. Our knowledgeable team of onboard Destination Consultants is delighted to share their regional expertise to Silversea guests, with informal discussions throughout your voyage and commentaries from the bridge. Elevating your cruise travel adventure to more stimulating heights. Gain an insiders perspective on your voyages destinations. From where to shop, to top-rated eateries, and the areas must-see sights. Silverseas Destination Consultants can also help you select the ideal shore excursions. They might even come along for the trip. Ensuring you will journey ashore like a true native. Throughout your journey with Silversea cruises, let your desire for learning and personal growth deepen. Engage in our Silver Perspectives Enrichment Programme, as we welcome distinguished guest speakers on board for fascinating lectures and stimulating conversation. Spend your days at sea developing a richer travel experience. Delve into topics related to your cruise destinations from tribal customs to ancient history. Listen to intriguing presentations by authors, journalists, naturalists, diplomats and professors. Ask questions. Relish enlightening commentary. Cultivate your enduring quest for knowledge on a Silversea voyage, where curious minds grow beyond measure. Adventure abounds on our Silversea Expedition cruises. And as ideal companions to your onshore excursions, our highly qualified team of experts elevates your travel experience to the extraordinary while on board. Let your curiosity roam on our Expedition cruises. Listen to intriguing lectures by touted historians. Examine scientific theories with geologists and biologists. Engage in a guided field study alongside eminent naturalists and ornithologists. Comprehend the incredible on a Silversea Expedition voyage, where the destination is only the beginning.